Turning water into wine and getting his team to 3-1 at the quarter mark of the year has earned Mike Vrabel praise from the media. When the Tennessee Titans fired Mike Mularkey after a divisional round loss to the New England Patriots, fans and media were split on the decision. On one hand, the Titans were parting ways with a coach who rattled off a pair of 9-7 seasons in his two full years with the team and won a playoff game for the first time since January of 2004. On the other hand, the Titans should’ve won more games than they did and shouldn’t have struggled against inferior teams, and the insistence on an offensive scheme that was clearly outdated and was hurting the team’s franchise quarterback was an indictment on Mularkey. When the Titans hired Mike Vrabel to replace Mularkey, fans and media were split on the decision. On one hand, Vrabel left a lasting impression on nearly every player and coach he played and coached with or for, while he also had a strong pedigree as a position coach for Ohio State and the Houston Texans. On the other hand, Vrabel was among the least-qualified of all of the candidates for the Titans’ head coach position, as he only had one year of experience as a coordinator and his defense was underwhelming during that year. Four games into his head coaching career, Vrabel looks like a home run hire, and all of the talk about his inexperience and qualifications has been thrown out the window. Vrabel has had to deal with a truly astounding amount of adversity during his short time with the team. His All-Pro right tackle missed the first three games of the season. His Pro Bowl left tackle missed a game and a half with a concussion. His franchise quarterback missed about two full games and still isn’t 100-percent healthy. His Pro Bowl tight end got injured in the first game of the season and is out for the year. His most accomplished wide receiver quit on the team and was subsequently released. There was also the marathon Week 1 game that was delayed several times and featured the left tackle, tight end and quarterback being unable to finish the game. Despite all of the aforementioned and several other bumps in the road, Vrabel has rallied his team and rattled off three-straight victories. Two of those came in division games and the other was a signature, come-from-behind win against the reigning Super Bowl champions. Within all of that, Vrabel has shown a propensity for gambling in high-leverage situations and trusting his players to make the game-changing plays when put in good positions. The Titans have gone for it on fourth down seven times so far this season and have converted five times, which is first in the NFL by a comfortable margin. With his team sitting at 3-1 after an improbable first month of the season, Vrabel has gotten recognition from the national media, which rarely gives the Titans the light of day. His performance to this point with a team that’s gone through a lot has earned him praise, and many are calling him the Coach of the Year at the quarter mark of the season. "Mike Vrabel might be Coach of the Year a quarter into the season." – @PSchrags after the @Titans' OT win over the Eagles. Thoughts? 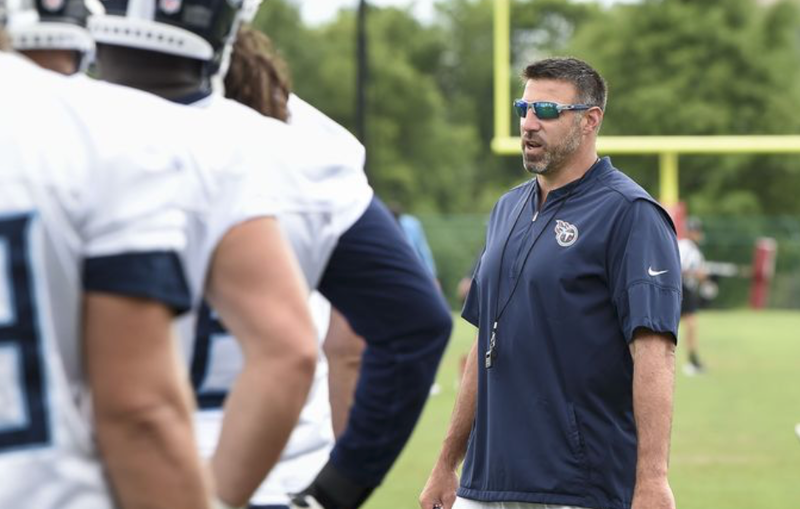 #Titans HC Mike Vrabel has @mlombardiNFL’s attention after 1 month. I had my doubts about Vrabel when he was hired, but those doubts have been effectively crushed after just four games. Yes, it’s early for anything to be decided. No, it isn’t too early to realize the Titans nailed their head coaching hire. Vrabel has infected the team and organization with energy and hope, and it has already translated to wins on the field. Everyone is starting to take notice.